Creative Parenting 101: Discipline Can Teach a Lesson AND Be Entertaining! When the older boy was approaching seven years old, I started to notice that he was taking certain things for granted. It was really ticking me off, so I discovered (either in a magazine or on tv, can’t remember exactly) what I thought at the time was a really great idea…and now I can say it was Pure Genius. I made him start a “Thankful Journal”. Each day, I had him write about two or three things that he was thankful for in a blank book that I had purchased especially for this purpose. It made him think, it gave him much-needed writing practice, and gave us great conversation starters. Of course I don’t think that’s too young! And if it takes a long time, well then who cares? It’s not like a six-and-a-half year old has Prom plans or a job to go to, right? Anyway, as you can imagine, the boy wasn’t too crazy about the idea. On some days, after he got used to it, he rolled with it. I told him that he could illustrate some of the pages, too, and that got him a little more excited. Occasionally he didn’t have anything “new” that he wanted to write about in regards to his level of appreciation. Fine. I told him to just write about something that had happened in his day. 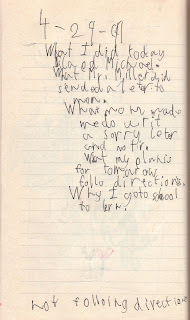 On a few occasions, he wrote about getting in trouble at school. You’ll see one of those pages in a minute. After about six months, for whatever reason, we stopped keeping up with the Thankful Journal. I can’t remember why but it really doesn’t matter. I am very happy to report that my kids are very thankful and appreciative about most things in general. In fact, you know those chicken commercials where the kids stand up on the chair and make a grand production out of thanking their mom for making them the chicken for dinner? My kids actually–without standing on chairs–regularly thank me for things like making dinner, or getting them the kind of cheese they like to eat, or for finding something they had been looking for. You get the idea. I can’t say that the Thankful Journal was completely responsible, because I didn’t do it with the younger boy and he is still an appreciative person…but I think it had to help! Oh: I almost forgot. The entertaining part. 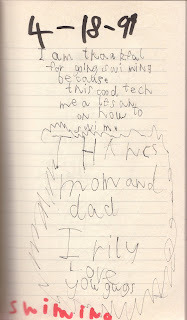 Now that it’s about nine years later, I pulled the Thankful Journal out and showed it to the older boy. He was acting very embarrassed about it, especially when I read him what he wrote in a John Lithgow-y dramatic way, but we had some great laughs. My advice to all of you out there with little kids? Have them do something like this! If not a Thankful Journal, then a homemade photo scrapbook where they write their own captions (we did this too), or a blank book full of drawings with captions, or something like that. Put these creations away with your other treasures, and pull them out in ten years. You’ll be SO happy you did it. And after all, childhood only comes around once! 3/30/99: I am thankful for the Hot Wheels thing and mom and dad and McDonalds. 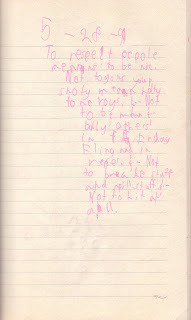 4/18/99: I am thankful for going swimming because this could teach me a lesson on how to swim. Thanks mom and dad, I really love you guys. 4/29/99: What I did today: Slapped Michael. What Mr. Miller did: Sended a letter to mom. What mom made me do: Write a sorry letter and no TV. What my plan is for tomorrow: Follow directions. Why I go to school: To learn. 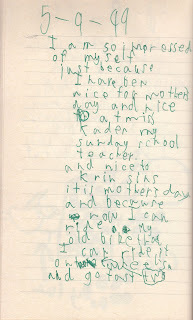 5/9/99: I am so impressed of myself just because I have been nice for Mother’s Day and nice at Miss Kaden my Sunday School teacher. and nice to ??? ???. It is Mother’s Day and because now I can ride my old bike that I can ride it on two wheels and go fast. 5/28/99: To respect people means to be nice. Not to use your snotty mean tone voice. To not to be mean and not bully others in Friday Fling and in recess and not to break stuff and not to hit stuff at all. 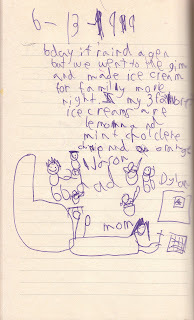 6/13/99: Today it rained again and we went to the gym and we made ice cream for Family Movie Night. My three favorite ice creams are lemon and mint chocolate chip and orange. 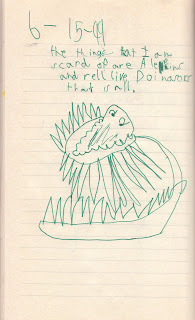 6/15/99: The things I am scared of are aliens and real-live dinosaurs. That is all. You have two very sweet boys! I love the thankful journals. I love the fact that our parenting styles are very similar. 🙂 Makes it fun when we’re together. Ok…that was from me….Dawn! 🙂 MUST. GET. BLOGGER. ACCOUNT. I love this! 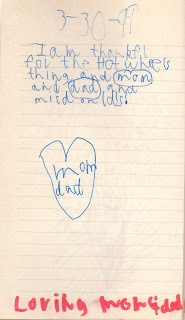 I keep boxes full of things like this from my kids, but a journal is a great idea! OMG! I LOVE it! My 7 year old brought hom these books they wrote in school, and I am SO saving them to show him later – they’re hilarious! I love the pictures and the writing style. Too cute, too funny!!! SO cute! I have a pile of notes that my 16 y.o. wrote (and illustrated) when she was little. They are tucked away in my jewelry box and dresser. We pull them out from time to time and have a good laugh – or cry! Hmm, with summer break quickly approaching, I think I’m going to borrow this idea. Hope needs all the practice she can get with writing. That is awesome! AND Hysterical! Love it! That is way too cool! I love how he’s writing what he learned (and apparently it sunk in) and that it’s all in one place where you can find it. Give me another year, and I may start something similar for Mister Man! I blog hopped over from Mommy Just One More Minute! and I LOVE this post and this idea! The day he slapped Michael made me laugh so much I actually read it to my husband…who also got a big kick out of it! What a treasure those journals are!! Thankful Journal..What a cool idea… my kid would love that. May have to be a summer activity. Awww. That is totally endearing. Tuck it away until he’s engaged, he will be embarrassed but his fiance will love it. Welcome, to all of you newbs over here! Glad to have you! Previous post: Happy Day, Daddios!